Apologies for the delay in blog posts. I've been so busy with trying to to complete my personal and collaborative projects, as I'm writing this it is Friday the day of the deadline. This will be the lastx production diary post, I'll try and continue to post my progress on the reaming animations in the near future. So all in all for the personal project, I completed all animations bar two, which I'll be finishing after the hand in. I managed to get roughly 20 seconds of footage with the animation I have done on the personal, all rendered out. Here's some view port preview's of my animations, can you tell what they are? Hello everyone, and welcome to Sketch Book Looks, a blog post series where I'm going to show you some of my most recent studies/drawings/sketches .etc I'm uncertain on the time period between Sketch Book Look's Posts due to other ongoing project work. Okay, sooooo, lets get started! So the first drawing is something literally from my head. Its of this fantasy valley as you can see in the sketch below. Two trees which I'd like to colour pink and use a nice cool colour palette. 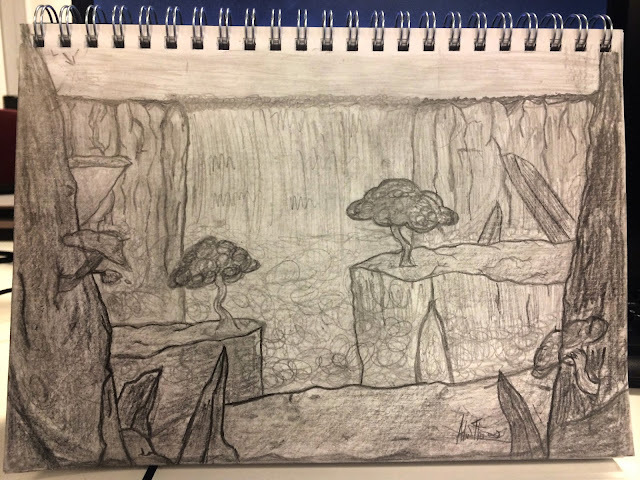 I want the mist of the waterfall to be quite a bing thing for atmosphere in this drawing when I take it into Photoshop. There are somethings I might add and take away whilst working on it in Photoshop, I mainly really needed to get a good idea of what I was seeing in my mind on paper first. Terribly sorry for the gap between posting, we had a Easter break which was very much filled with work for myself, however I did get to have some free time off which was good. Anyway, I'm here to update you all on my Personal Project. 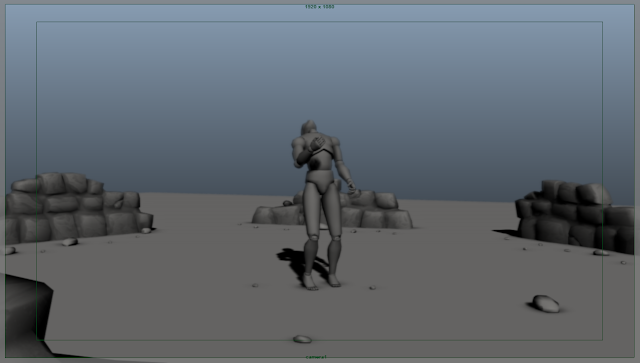 All is going well at this point, I'm currently posing out my 'Neck Break' animation sequence followed by the final animation for personal which is the 'Fight Sequence'. From then on out I will be setting up the rendering scenes for the 7 animations. So now I'm going to show you one of my animations I rendered out yesterday, it look 17 hours to render out. Did I mention? I hate rendering?